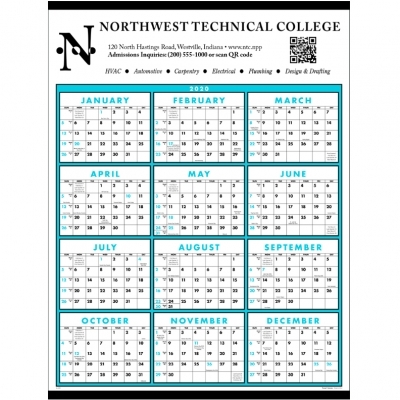 Our most popular commercial calendar because it has a large ad space. There is room to write in daily appointments. Tinned at the top and bottom to hold its shape. The blue ink areas match process blue ink. Imprint size: 21" x 4 3/4". Standard imprint color: Black. Ink Matching, $24.00 per color. Multiple Color Set-Up, $31.00 per color. Wash Up, $18.00. Halftone (grayscale pictures) $22.00 each picture.